The inundation of Chennai over the last so many days and the sheer magnitude of the ravagement that city faced has left many of us, safely far away, just watching in disbelief. Yes, we mobilised ourselves and did what we could - from simply sharing information on social media to actively getting involved in relief efforts. It was only natural for me to remember how my own city ground to halt all those years ago on the 26th of July, brought to a standstill by incredibly heavy rains. We were brought to our knees for two days. No communication, no transport, and thousands trapped or stranded in cars, buses, on the roads, in offices, and all manner of random places. More than a thousand people lost their lives. We were living at V.T., on the top floor of an old building, with my parents in law on the floor below us. A family gathering had been planned and we were gearing up to have a feast for dinner with all the family present. The parents were going to drive in from Lonavala that day. Some time that afternoon I noticed how strangely overcast it had suddenly become and some instinct urged me to check with the parents to see where they'd reached. They hadn't passed Panvel yet and I urged them to go back. I don't know why I felt it so strongly but after a bit of an argument with Dad, I managed to convince them to go back. It was drizzling already but the overcast sky had made me nervous for some reason. The parents drove back to Lonavala. By the evening it was raining seriously and news trickled in from the suburbs that there was a lot of water logging, the local trains were severely late, and crowds had built up at the stations, packed with stranded passengers. There was no Facebook or Twitter, but I was active on the Ryze Network. I saw posts there from various people about flooded roads, stranded vehicles, traffic jams, stalled trains, and worse. The city was in crisis and there were thousands and thousands stuck out there in the rains. I called up a couple of my friends to check if they were okay. Mostly people were still trying to go back home and it hadn't quite registered to us in South Bombay just how much rain fell in the suburbs that day - a whopping 944 mm in 24 hours. I did urge them to feel free to come over and stay with us, just in case they couldn't get home. I stayed online keeping track of my friends on Ryze. I remember chatting with one girl who was stuck in her office, till late in the night, just keeping her company. The Internet is an incredible thing and I was experiencing that incredible-ness right then. As the evening progressed things only got worse. People were stuck, unable to get home as the trains had shut down, and there was severe water logging on most arterial roads so traffic wasn't moving either. That night we had around 20 people staying over at our house. We knew just one person among them all, a friend. The rest were her office colleagues. Fortunately there was plenty of food (remember the family get together?) and space because the parents' house was empty. Between upstairs and downstairs we managed to fit everyone in. Hundreds of people opened up their homes, kitchens and hearts to help people in need. That is the way we are - fundamentally good and willing to what little we can to make things better in a crisis. We do the same today too. But in those days of no social media, at least not in the form it is today, there was no tom-toming of Muslims helping Hindus, Hindus helping Sikhs, or any of that. It was just about people helping people. And that's the way it should be. But we live in a world where politicians hijack relief materials and shamelessly delay the distribution to stick the face of their leader on the packets, and where the politics of religion is inescapable. 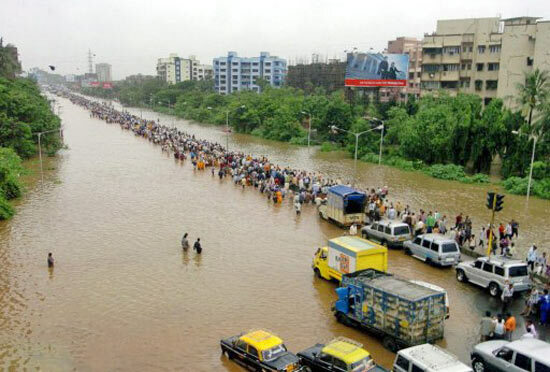 I have been following the news about the floods in Chennai, and this reminder of Mumbai's flood in 2005, when I was in India, highlights the tragedy, disaster, as it also does the strength of the human spirit in difficult times. Here in the land of tremors and quakes, surprisingly, the people in our city are scared out of their wits by the threat of floods! Heavy showers, incessant rains make them nervous, not that any major devastation has taken place due to floods. Though the sea does cause quite a lot of destruction to the edifices along the shoreline during a storm.